A cervical disc protrusion, more commonly known as a bulging or herniated disc, is actually a very normal occurrence for most adults. In fact, disc bulges in the neck affect more people than not in the adult years. Doctors now know that the intervertebral discs are continuously being subjected to stresses that make them bulge, but most of these conditions are transient. Permanent herniation represents a deeper level of disc damage, but is still considered completely normal in the mid to low cervical spinal levels. Intervertebral protrusions can occur on the anterior side of the disc or the posterior. Furthermore, they can occur in the center of the disc structure or off center when compared to the spinal orientation. Intervertebral bulges can be focused in size or may occupy a large section of the disc tissue. Finally, the degree of bulge can vary greatly, with some discs demonstrating more clinically significant protrusions that involve holes in the annulus fibrosus or outer disc wall. This research essay examines the various diagnostic classifications of cervical disc protrusions. We will use this opportunity to help patients to better understand their diagnostic imaging reports so that they are prepared to take more active roles in their treatment decisions. Most cervical herniated discs will occur between C4 and T1, encompassing the C4/C5, C5/C6, C6/C7 and C7/T1 discs. Of course higher level herniations are possible, but they occur much less frequently. The only level where a herniated disc absolutely can not occur in the cervical spine is between C1 and C2, since there is no intervertebral spacer in between these two spinal bones, individually named the Atlas and the Axis, respectively. The reason why herniations tend to occur in the mid to low cervical levels is due to the increased incidence of movement in these locations, as well as the levels of stress these discs are constantly subjected to in mobilizing the massive head. Disc degeneration is universally seen in these levels, usually being markedly observed after the age of 30 in most people. Hyperflexion and hyperextension injuries also tend to concentrate force on these intervertebral levels, helping to facilitate herniations in many instances. Anterior herniated discs face in into the front of the body and are almost universally considered complete nonissues by physicians. Statistically, they are rare and when they are found, are almost never symptomatic. 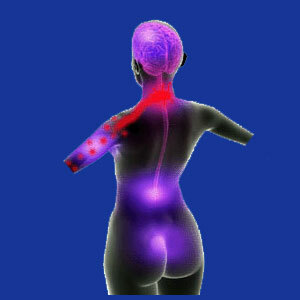 This is due to the fact that all the neurological tissue in the spine is located posterior to the discs. Meanwhile, posterior herniated discs are much more prevalent and stand the chance of influencing the spinal cord and/or spinal nerve roots through compression or chemical irritation in select presentations. Focusing on posterior protrusions, discs can herniate centrally, also known as medial bulging discs, or off center, known medically as posterolateral or paramedial herniated discs. Discs can herniate into the neural foramen, called foraminal bulging discs, or might actually extend outwards from the spine, called extraforaminal or far lateral bulging discs. Small sections of disc that bulge are known as focal herniated discs, while larger sections are called broad-based herniated discs or diffuse bulging discs. Statistically, central cervical herniated discs pose the greatest risk for compressing the spinal cord within the vertebral canal space. Meanwhile, cervical posterolateral herniations are the most common overall and pose the greatest risk for compressing or chemically irritating an individual nerve root in the lateral recess or neuroforaminal opening. Bulging discs are said to be contained. This means that they are structurally intact and feature a sound outer wall, called the annulus fibrous, which encapsulates the softer gel-like interior of the disc, called the nucleus pulposus. Bulges might be transient and can change often when imaged repeatedly. Herniated discs feature permanent or semi-permanent sections of damaged annulus that have allowed the nucleus to form a pocket of mass that protrudes asymmetrically from the disc structure. Other common diagnostic terms include disc protrusion and disc prolapse. Annular tears can form in any type of disc, whether it is herniated or not. However, when an annular tear forms in a bulge or herniation, the disc is now called ruptured. The nucleus material now has the opportunity to escape to some degree through the hole in the outer disc wall. When a large amount of nucleus material exits the disc, the structure is said to be an extruded disc. When the extruded material exits in many pieces, the disc is known as a fragmented disc. When the nucleus material migrates to separate completely from the main disc body, then the disc is said to be sequestered or features one or more sequestered fragments. Discs that desiccate, herniate, and/or rupture and eventually become skeletal in composition are known as calcified or ossified discs. We hope that learning the meaning of these diagnostic terms is helpful to you. For more information on the complete classification of disc abnormalities, please enjoy our sister website located at Herniated-Disc-Pain.Org.